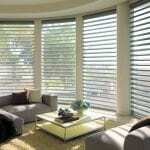 Choose the right window shades from our many options with our expert help. Blackout shades– Great for nurseries, theatre rooms or people who work night shifts, blackout shades are a great choice for people who want their rooms to be dark, not just dim. Fixed shades– If you have an unusually shaped window or one with a feature point such as an arch, fixed shades can help give you privacy with shades while also fitting into unusual spaces. Panel track shades– Panel track shades are a great option for when you need large spaces filled easily, such as with a sliding glass door, pergola, or sunroom. Cellular shades– With gentle light-filtering effects, cellular shades are wonderful options when you want privacy while still keeping the area light and airy. Roman shades-A great mix between curtains and blinds, Roman shades give you privacy and style as well! If you would like to learn more about our window shades that we can offer to you here in Owen Sound, we would love to talk with you. Contact us today here at Ashtons Blinds for information or an in-house examination of the samples we offer. We look forward to talking with you. At Ashtons Blinds, we offer window shades to residents of Thornbury, Collingwood, Meaford, Owen Sound, Craigleith, and The Blue Mountains, Ontario. At Ashtons Blinds, we look forward to providing you with personal service along with top-quality blinds, draperies and shutters for every room in your home or business in Thornbury, Ontario. Contact us today! Motorized Blinds: The Next Best Thing in Automation!